As a mom I am always concerned with the type of food my little guys are consuming and with the rate of child obesity more than doubling in size in the last 30 years according to the US Center for Disease Control and Prevention, it seems I have a good reason to b. So when the representatives of Slammers Snacks, an organic, portable, superfood snacks that is loaded with antioxidants, fruits, and vegetables reached out for me to try their product there was no hesitation. As soon as my little guys got off the school bus I was waiting on the front porch for them to sample their first Slammer Snack. I had two flavors for them to try first up was Pomegranate Grape Crush (grape, pomegranate, coconut, apple, banana and purple carrot) and then Chill’n (bananas, blueberries, butternut squash, greek yogurt and yumberry). Each child had his own favorite and laid claim on the rest of that flavor. My oldest son who is an avid reader quickly brought to my attention that on the back of the boxes not only do they describe the flavors and give details about some of the more exotic fruit/vegetable, but they also tell the story of the company. 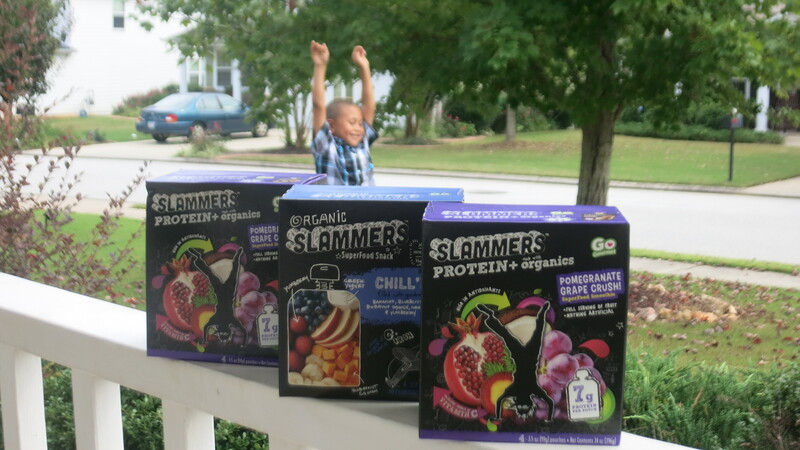 I am truly happy that they enjoyed Slammers because it certainly makes packing a mid day or afternoon snack a no brainer for this mom, its healthy and convenient. 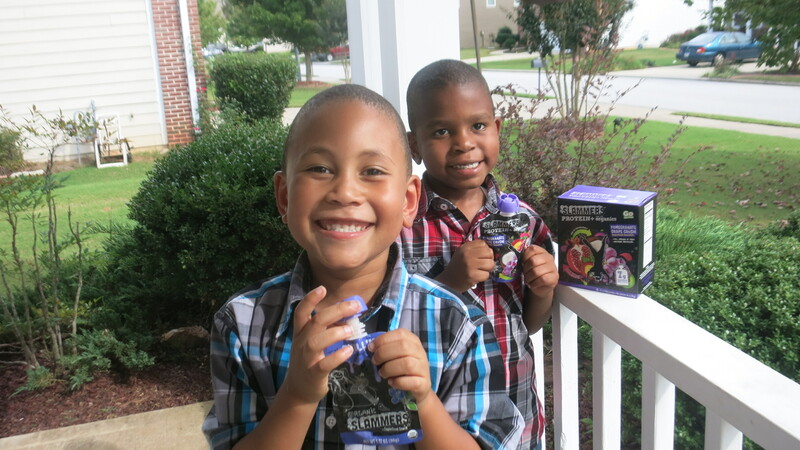 Slammers can be found at Target, Publix, Safeway and many more. 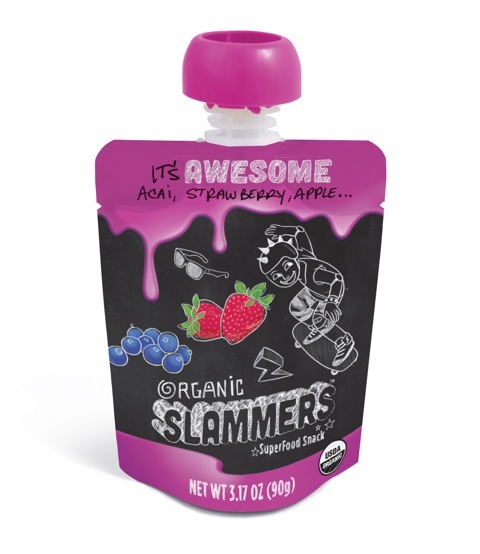 To find Slammers at a store near you click here. My kids love anything that comes in a pouch! I think these would be a huge hit. Those look so great. When my kids were that age, they made huge messes with everything I gave them. I wish I’d had these. These sound like a great new healthy snack option. I will add them to my grocery list. those look like products my kids would enjoy too. I love thta they have protein in them! YUM and healthy. Dina recently posted…PINCHme a fun samples service to subscribe to! I don’t know what it is about pouches, but kids love them! What a great way to get fruits and veggies. I’d definitely bring these on trips and errands. I love how healthy these are and that the fruit flavors sound really good. I bet my nephew and neice would love those. I like to wrap up small gift for Christmas and these would be great.. I like to give snacks and small items because they travel a lot. The grape pomegranate would have been my choice. Don’t you love it when your kids are able to read something to you? Thanks for sharing the information on this delicious, healthy snack. Those are some very happy looking boys. Looks like they really enjoy Slammers! Need to try these. I love giving my daughter snacks that are not too sugary–she loves anything that comes in a pouch that is fruit or veggie based. A win for both of us. Your boys are so cute. It’s good you are teaching them healthy eating habits while they are young. 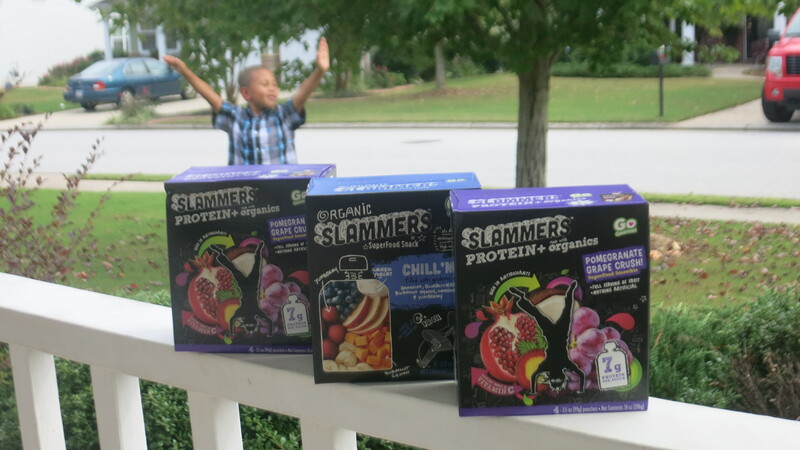 Slammers look like a great snack for on the go. they are so easy to store you can take them everywhere. I will have to get some Slammers for my friends little girls. They will love them the next time they come over. These look great. My kids love stuff like this for on the subway and street car when we are out and about! Those sound like a great snack for busy kids. I tend to pick up things that are grab & go. It’s good to know there are healthy options, even if you’re busy. These look awesome! I know my kids would LOVE them! We love the squeeze pouches!